Background and Methods: Ratiometric fluorescent probes can provide more precise measurement results than intensity-based fluorescent probes. Carbon dots are convenient platforms to construct ratiometric fluorescent probes. Carbon dots-based ratiometric fluorescent probes can be constructed by carbon dots and other fluorophores’ simple mixing or by connecting them via covalent bonds or non-covalent bonds. Otherwise, dual-emission carbon dots can also be taken as the ratiometric fluorescent probes. Carbon dots are reference signals, energy donors, response signals and the double emission matrixes in ratiometric probes. 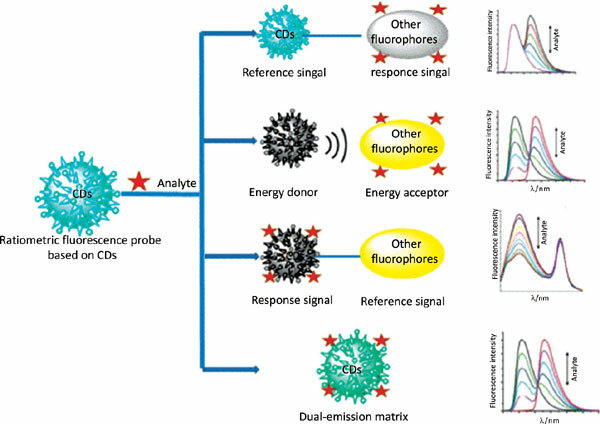 Conclusion: The development of carbon dots-based ratiometric fluorescent probes in recent five years is reviewed in this study which emphasizes their photoluminscene properties, detection mechanisms and applications. Ratiometric, probes, carbon dots, photoluminscene properties, mechanisms, applications.